Palhares and Ferreira are targeted for the next season of Versus 3. The final bout has not yet confirmed though, sources said that a verbal agreement has been done for the two fighters. Brazilians Rousimar Palhares (11-3 MMA, 4-2 UFC) and Alexandre Ferreira (18-7 MMA, 0-1 UFC) are slated for UFC on Versus 3. Sources also confirmed that verbal agreements are in place for the middleweight fight. This fight will come as a debut fight for Ferreira at 185 pounds. UFC on Versus will take place March 3and could take place in Ketucky and though Bellator has yet to finalize a venue for the event, Louisville’s KFC Yum! Center and Freedom Hall are under heavy consideration. 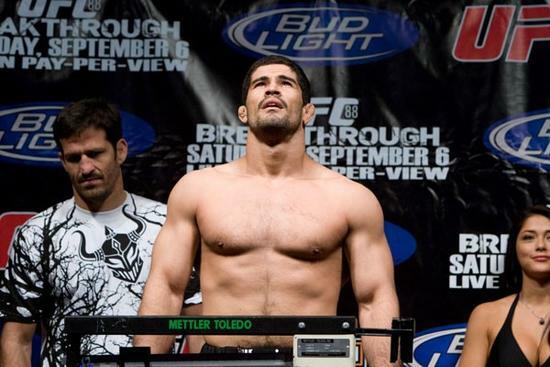 The Palhares vs. Ferreira is yet unknown if they will be a part of the night’s Versus-televised main card. Palhares is on the mend after contender Nate Marquardt halted his three-fight win streak at UFC Fight Night 22 in September with a first-round TKO loss. Still, it was a disappointing setback for Palhares, a Brazilian Top Team devotee who rose from abject poverty to become a UFC prospect by stopping half of his six octagon opponents by submission. Ferreira, meanwhile, is hoping to right his ship after stumbling this past November in his octagon debut against light heavyweight Vladimir Matyushenko at UFC 122. FightingInsider will keep your posted for the final line-up of fighters for Versus 3.